Get ready for an aquatic adventure! How about taking the whole family for a boat ride today? But we don’t mean one where you’re sensibly seated and sipping a strawberry milk drink in the sun on the deck of a boat! What we’re talking about here is real physical activity and, most of all, about a fantastic shared experience in a sea kayak on the Bay of Somme ! The bay is one of the few areas to offer this activity, so don’t miss it! At water level with your hair blowing in the wind: the feeling is magic! 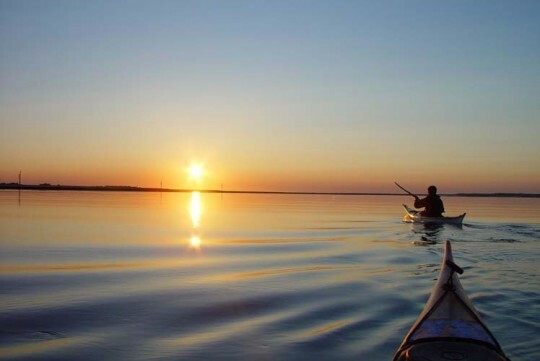 You can let the tide take you where it will, while you paddle together with your crew! With several paddlers on board, the kayak easily takes on speed for fabulous thrills! What you’ll note is that the landscapes from the sea are nothing like those on land. You’ll see a profusion of curlews and seagulls. They’ll fly along to make sure your experience is unique! You’ll enjoy a timeless moment, a moment of well-being; you’ll go home tired perhaps, but happy! And there’s more: kayak outings can be organized for observing the seals in the Bay of Somme!